Looking at David Taborn’s work is always fun. This is not for a lack of seriousness on the artist’s part. But that we should feel such enjoyment in observing his works, and that this enjoyment should seem unusual, perhaps even uncomfortable, does say something about the way art today is supposed to display its seriousness. Visual pleasure, vivid colour, robust, energetic, sumptuous and demotic forms – such experiences are often thought of as trivial or superficial, as somehow ‘merely’ a question of individual gratification or self-indulgence, when there are more sober and pressing matters in the world that art should attempt to address. But Taborn’s fun is difficult fun, its pleasures are ones born out of effort, and challenge, and don’t offer passive, retiring gratification. Because for all their colour and sheen and sparkle, Taborn’s works never release us from an awareness of their forthright materiality, nor of the compounded energy that has gone into their fabrication, nor of the sustained choreography that has brought together disparate techniques and technologies to produce objects that are already too much to be paintings, and yet cannot quite be described as sculptures. What might they be, then? Asking that question, answering it, also requires an effort. It requires an effort because Taborn’s work plays assiduously with the ways in which we make a distinction between art and ‘ordinary’ objects, between objects and images, and between sculpture and painting. Taborn has for a long time made what we might call ‘paintings’, but over time this has become an increasingly inadequate description of the things he makes. 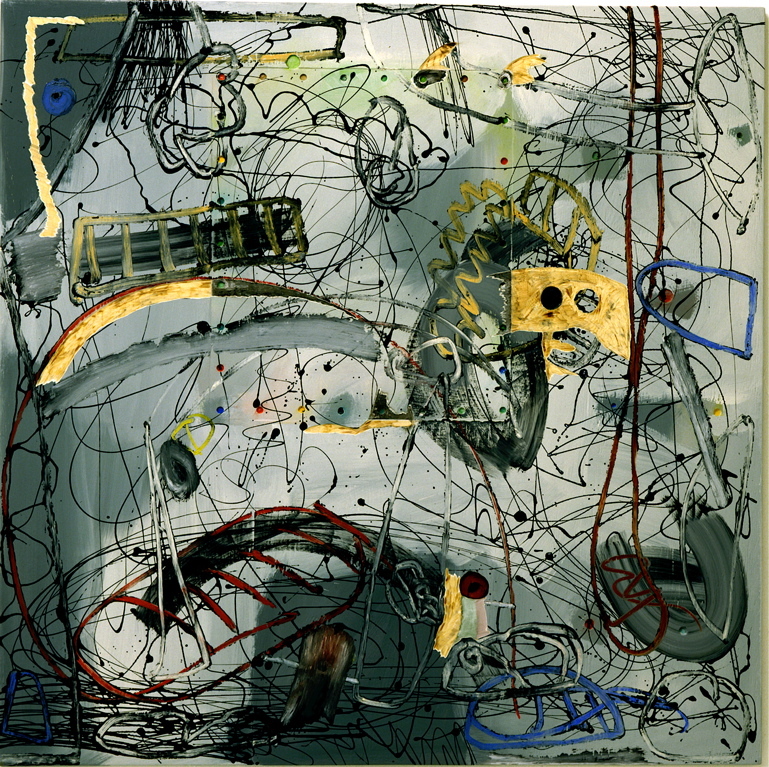 Dripped, mixed coloured resins, running like molten plastic, poured quick onto sheet steel or mirrored Plexiglas or plywood, then gouged, routed, ground with angle-grinders, inlaid, cut and re-cut, repainted, layered, masked, spray-painted, drilled, objects set-in and mounted behind glass or encased in clear-resin, pipes constructed and welded – the list of operations Taborn performs on these painting-like objects is dizzying. And in the works made recently during his residency at UrbanGlass, Taborn has departed completely from his more habitual wooden armatures, adding to his list of material experiments the qualities of neon light, kiln-fired shaped glass, half-mirror and liquid metal, with the same enthusiastic, forthright wit and humour. Painting, then, seems far too meagre a description for Taborn’s practice. It’s possible that these objects start from an idea of painting, but they very soon reach the limit of its formal definition, at least in terms of materials; painting seems like a meagre set of options when confronted with Taborn’s cornucopia of material options: just oil paint? Just on canvas? Just stretched on a wooden stretcher? Is that it? 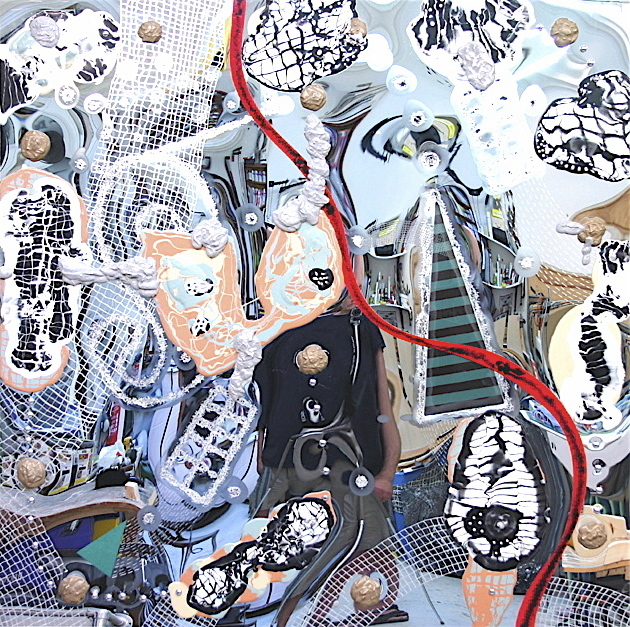 If the formal definitions of painting are quickly exhausted and superseded by Taborn’s heterogeneous combination of materials and techniques, these also quickly exhaust its conceptual definitions. Those old-fashioned preoccupations of late Modernist painting, such as representation, abstraction, flatness, illusionistic depth and the material presence of paint – in other words, all those things that were only really questions when the only question was which way to apply paint to a canvas support – are all made redundant by the expanded repertoire of materials that Taborn brings together in his objects: to talk about representation and abstraction makes little sense when faced with an actual object embedded in the surface. Why talk about the illusion of depth, when actual depth is carved into the physical layering of hard, resin colour, or when your own image stares back at you in the mirror inlaid into the surface, or when the neon light behind the mirror-glass switches on, revealing what was previously hidden. If they can no longer be called paintings, then how do we describe one of Taborn’s works? A complex thing-on-the-wall which, while not necessarily a painting, starts out from painting to find out where painting stops. A kind of escape from painting. But if it is an escape, it isn’t one that wants to run as far away as possible from the imprisoning confines of painting, into some other form of art-work, nor does it reject the history of modern painting out of hand. Instead, Taborn’s work continuously returns to the starting ideas of Modernist painting, each time to explore how far it can extend its material possibilities before those ideas disappear. Rather than an escape from painting, you could think of Taborn’s things-on-the-wall as the escapology of painting. Escapology, as fans of the Great Houdini will know, isn’t escape from externally imposed constraint to a state of actual freedom, but an entertainment based on the performance of escape from self-imposed constraint, in which the greater the seeming impossibility of escape, the greater the enjoyment derived when the escapologist in fact succeeds. Taborn’s things-on-the-wall therefore derive their strength – and our enjoyment – from the virtuosity with which they escape the narrow problematic of modern painting, while never letting out of sight the point from which that escape is staged. That’s why, however elaborate, Taborn’s escaping of painting is never an abandonment of painting’s more fundamental questions, but rather the playful and unabashed extension of its terms. It’s not the mere success of escape that is the art of the escapologist, but rather how elaborate and breathtaking the form of the escape, and Taborn’s work offers us bold and unpretentious investigations of modern painting’s ongoing question; the point at which the thing we see becomes more material object than image, and yet still enough of an image not to be seen as a sculpture. Because for all its optimistic dynamism, Taborn’s work offers us a serious contemplation of certain fundamental issues regarding our relationship to art-works and objects; about how a thing-on-a-wall may or may not be seen as a sculpture, and may or may not be seen as an image. In this, Taborn brings back to contemporary relevance the terminal problem of late modernist painting – the type of abstract painting championed by the critic Clement Greenberg in the 1960s – which foundered on the point at which abstract painting became so flat and uninflected (in the work of the ‘colour field painters’) that it could start to be seen as an object rather than an image, an experience that was more material than it was optical. It was the work of Frank Stella that famously sets this problem in motion, opening the door to Minimalist art, but it is Stella’s later work – the shallow constructed and painted assemblage-reliefs of the 1980s and 90s – that the dichotomous tension between image and object is most vividly and exuberantly played out. Taborn’s investigations extend this exploration by pushing to extremes the way in which his things-on-the-wall offer themselves as assemblages of objects and materials, while still retaining the possibility of being seen as images. By exploiting both the visual habit of seeing frames on walls as images, as well as the practical condition of how things on walls constrain us to one set of angles (he has never been interested in making free-standing objects we might walk around) Taborn makes an inquiry into how the experience of objects and the experience of images may be combined, rather than set in opposition. Taborn’s things-on-a-wall could then be described as images-becoming-objects-becoming-images, where previously image-making paint becomes material, and material objects are turned into images of themselves. What they steadfastly do not do is become sculptures. Rather they explore materially what painting could only do by illusion – space, depth, assembly, and arrangement – while remaining on the borderline between image and objects. But in this, Taborn’s sensibility draws on a broader experience than the rarefied dispute that moves painting from representation to abstraction to materiality and the sculptural. Taborn’s approach, in its sense of pleasure and enthusiasm, shares much of its understanding of the combination of material things and images with what we experience in mainstream culture. It’s in our day-to-day culture that we most experience the energetic combination of images and objects working together, in forms which put objects into the ‘frame’ of various formal ‘scenes’. This is the common world of pinball machines, model racing cars on their circuits, fish in aquaria, clock faces of all sorts, disco lights, back-illuminated animated commercial display units, sports of every kind where the position of the players relates to a designed pitch or court, chess and countless other board games, executive desk toys, Pool tables – the list goes on. These are moments where we fully understand and appreciate the synchronicity that occurs between an object and its own image. It is this world that Taborn’s objects inhabit when they mirror your reflection, stare at you through lenses, blink lights at you, chatter, click, appear and disappear, make noises: objects that use a greater combination of effects and experiences than mere, static paint on a canvas. Taborn’s art, then, is a sort of cultural escapology too. It releases painting into the world of objects, and releases objects into the world of painting. 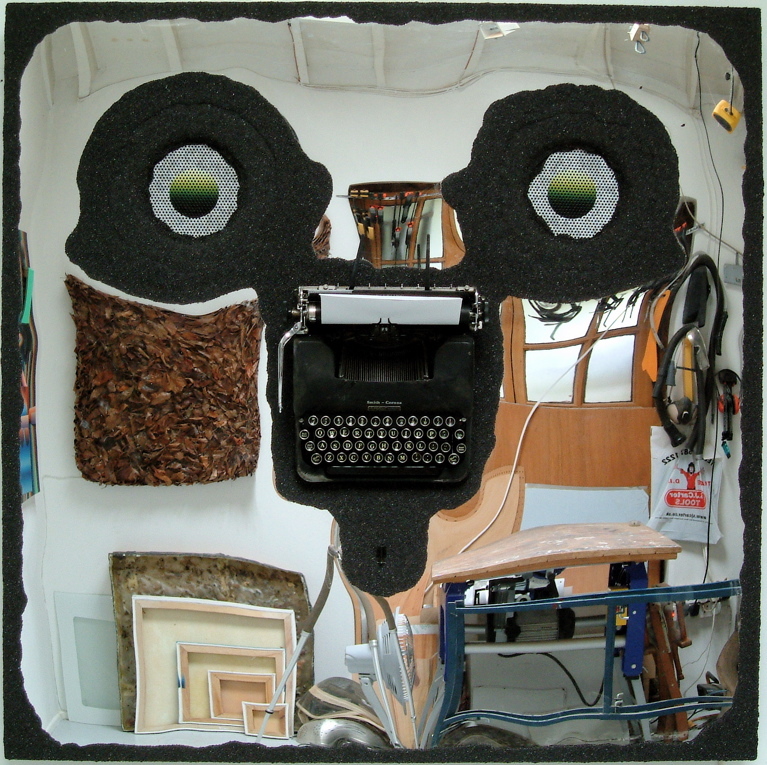 But by doing so, it releases art from the confines of its own, institutionally-bound definitions, extending it across the divide between art-object and common-objects by exuberantly contaminating painting with the world and sensibilities of ordinary things, just as the visual orchestration of painting – composition, illusion, image – absorb those things into it. If this seems fun, it is down to Taborn’s generous and unrelenting desire to release the pleasures of painting, and the pleasures of our ordinary world into each other.